Make your kitchen the heart of your home with Dream Doors Southampton. Speak to our designers and view our stunning collection at your local kitchen showroom in Chandlers Ford, Eastleigh. 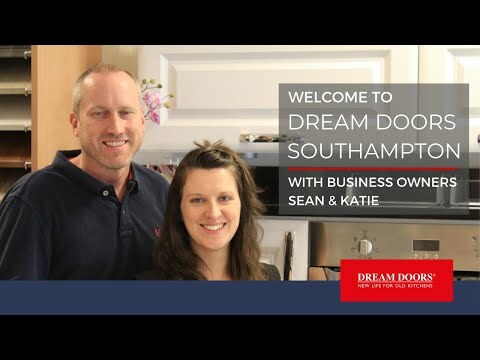 Discover your perfect kitchen at Dream Doors Southampton where Sean and Katie are waiting to help you create your ideal design. Our showroom in Chandlers Ford, Eastleigh is full of kitchen designs to spark your inspiration with our experts on hand to help. Dream Doors Southampton, also provide a service to neighbouring Winchester & Hedge End, as a local family run business. Owners Sean and Katie have lots of experience in creating dream kitchen spaces that have the ‘wow’ factor. As your local kitchen design and installation company, they can discuss all your options in order to find a style that works in your home. All Dream Doors kitchens are designed for the individual, so whether you want a classic or traditional look, or you prefer a contemporary or modern style, we can help. At our Eastleigh showroom, you will find matt, gloss and woodgrain finishes, as well as a large selection of colours on offer. Our kitchen designers can come to you. Show them your kitchen space and they will provide you with a free, no obligation quote. Sharing your ideas with Sean and Katie will help them develop a functional kitchen that you love and is fully customised to meet your tastes. Dream Doors Southampton offers kitchen makeovers to all local SO postcode districts in Hampshire. This includes Lymington, Beaulieu, Hythe, Fawley, Totton, Southampton, Netley, Hedge End, Botley, Eastleigh, Chandlers Ford, Romsey, Winchester, Fair Oak, Swanmore, New Alresford, Micheldever, Lyndhurst, Curdridge, Waltham Chase, Broughton, Sutton Scotney, Ower, Minstead, Ashurst, Rownhams, Upham, North Baddesley, West End, Kingsworthy and all local SO Hampshire UK areas. "Excellent service throughout. Final fitting took just two hours with no mess." "Very pleased with the work carried out by an efficient group of workmen." "Brilliant work - neat and tidy and left with a quality product."